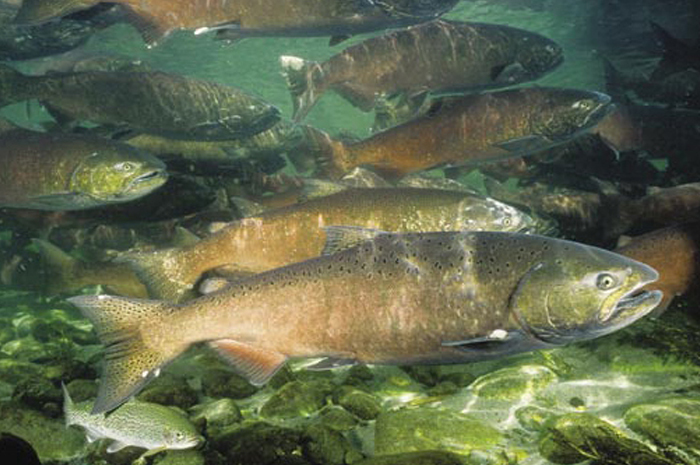 The West Coast's "king of salmon", the chinook, is suffering from the effects of man-induced climate change. Populations of the favorite of sportsman and commercial fisherman are down, so extremely low in fact, that Alaska has cancelled its chinook season this year. Warm water temperatures are blamed for the lack of ocean prey species, which of course reduces the number of salmon that survive to return to their home streams for spawning. The lowest level of surface nutrients on record were seen in 2014 which starved phytoplankton, which starved zooplankton, that starved herring, which Chinook eat. Conditions have improved since "the Blob" lodged in the Gulf of Alaska in 2013, but salmon populations have yet to rebound. California, Idaho, British Columbia and Washington have restricted fisheries in response. Even in salmon-crazed Oregon, a state fish manager admits "This year is bad. I don't see next year as being any better." Global warming is gradually heating the surface waters of the Northern Pacific, making extreme events like the Blob more likely. Surface water temperatures are still elevated a few degrees Fahrenheit above normal. NOAA's recent salmon survey show ocean salmon are still in decline. The results of the research are scheduled to be released in September. Climate models do not show the North Pacific heating up this much so soon. So there is some hope that conditions will improve for the king of salmon. Meanwhile, the cancellation of Alaska's season is estimated to cost the troll fleet and processors $6 million.